· APP CONTROL OR REMOTE CONTROL: WIFI connection between drone and smartphone, allows you to enjoy FPV faster. You can also control the RC drone with a functional remote control. · Beauty mode: with the special beauty mode in the app, you can make your photos and videos more beautiful and amazing! 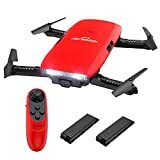 3D shooting function and flight plan, which provide lots of flying fun. · EASY CONTROL: The 2.4G selection controller with G-sensor control and the Barometer Altitude hold function easily control your drone by tilting the phone and providing a simple take-off / ground operation. · EASY TO CARRY: The foldable fuselage design offers great portability and ease of transport.